Now that Library Park is no longer under reconstruction, saxophonist Pat Loomis and his great Friends band has booked four dates for its famous outdoor Jazz & Blues concerts, each one with a so-called Special Guest. FOSEL and the BPL’s South End library are jointly sponsoring the concerts, which will take place on Tuesdays, July 23, July 30, August 20 and August 27. Yes, we will serve delicious slices of fresh watermelon, as always. There will be some seating provided but feel free to bring your own. And yes, you can dance. Stay tuned for details. …and it will be over by 11:05 AM, so come early. As always, the Easter bunny will distribute many hundreds of eggs filled with chocolates, poems and knock-knock jokes. There will be delicious refreshments, warm coffee and cool lemonade after the hunt. FOSEL has already ordered good weather and hope it will be delivered in time. We have baskets for those who can’t find their own from last year. We expect the Area D4 police to be available, as they always have been, for those crossing Tremont Street. There will be a separate area cordoned off for the very young so they won’t be crushed by their enthusiastic and experienced older hunter colleagues. For those whose naps ran a bit late, the Easter bunny will have some extra eggs reserved especially for you.. Does the image above remind you of the design of the South End library? No surprise if it does, as it was the product of the same architectural firm of Mitchell/Giurgola, then based in Philadelphia, now in New York. Dan Kelley, the principal architect of MGA Partners, which began as Mitchell/Giurgola, will be at the South End branch to talk about the library’s architectural history on Tuesday, March 12, at 6:30 PM. In a talk titled, Beyond City Hall, Kelley will describe how Romaldo Giurgola, one of the key figures of The Philadelphia School of the 1960’s, challenged doctrinaire modernism with designs and buildings that conceptually recognized their context. Giurgola completed the BPL’s South End library branch in 1971 as he and the Mitchell/Giurgola Architects firm attracted national and international attention for their work. Giurgola was awarded the AIA Gold Medal in 1983. In his presentation, Kelley will track the ideas in Giurgola’s work and survey the design history of the firm’s South End library project. Romaldo Giurgola left Philadelphia when he became the chair of the Columbia University School of Architecture and Planning, around the time the South End branch was designed. He opened a second office of Mitchell/Giurgola in New York City, and later moved to Canberra, Australia, when the firm won the competition to design the Australian Parliament building. He passed away in 2016. His partner in the firm, Ehrman Mitchell, died in 2005. The Philadelphia office is now called MGA Partners. Next Tuesday, the Friends of the South End Library (FOSEL) will have its Annual Members Meeting where you can elect our proposed slate of directors, get updates on our financial status, programming and renovation plans. Eamon Shelton, the Director of Operations at the Boston Public Library. will be at the meeting to discuss renovation plans for the branch and answer any questions you might have. This is also the time when you can propose yourself as an advisor to the FOSEL board and/or sign up for any of its programs. Our proposed 2019 slate of voting-board directors this year is made up of current officers for the second of their two-year terms, most current directors and one new candidate. Officers serve two-year terms; directors one year. The candidates are: Marleen Nienhuis (President); Barbara Sommerfeld (treasurer); Kim Clark (clerk); Marilyn Davillier; Gary Bailey; Duncan Will; and Jennifer Watson (new). Our proposed 2019 advisory board includes many of the 2018 advisory board members: Anne Smart, Don Haber, Jacqueline McRath, Stephen Fox, Liane Crawford, Susanna Coit, Michael Cox, Michelle Laboy, Gail Ide and Nick Altschuller. Maura Harrington and Licia Sky asked to move from the 2018 voting to the 2019 advisory board due to increased commitments in their professional lives. In addition, Reinhold Mahler has agreed to join as a new advisor. Two wonderful 2018 advisory board members, Karen Watson and Ed Hostetter have moved out of state and are directing their generous volunteer efforts elsewhere. We thank them for their important contributions. Jon Santiago, who served on the FOSEL advisory board for three years, was counseled by legislative advisors to step down from all boards now that he is a newly elected State Representative (replacing Byron Rushing). We thank Jon for his advocacy and volunteering, and wish him the best. Barbara Sommerfeld has been a meticulous treasurer for eight years, patiently and graciously processing innumerable contributions for both capital and membership campaigns by FOSEL. She is an active and devoted South End library user who is always ready to volunteer in any FOSEL project. Kim Clark has organized board meetings, kept track of by-laws and written crisp and accurate board minutes. She has enthusiastically introduced numerous speakers for South End Writes, and recruited wonderful speakers (Mel King, Byron Rushing, Melinda Lopez). She is a longtime South End library user. Marilyn Davillier, a therapist, is an active contributor to numerous FOSEL ventures, including the South End Writes program and the Holiday Party, and has made excellent recommendations for past and future speakers on the subject of children’s developmental psychology. She and her husband, Ed Tronick, a renowned child psychologist at UMass, hope to create a seminar series at the library for families of young children. Gary Bailey is a Professor of Practice at Simmons School of Social Work, very active in and connected to a range of neighborhood associations, and interested in the role the South End library can play in the lives of homeless patrons. Duncan Will’s background is in secondary education. He is a member of the Local/Focus group, taking apart old displays and installing new ones. He works closely with Reinhold Mahler in this program. Jennifer Watson. contacted FOSEL in 2018 and has taken on FOSEL’s newest program, the Award-winning Books Window. She was in charge of the first display, the 2018 Massachusetts Book Awards. She is now planning the second display, the Edgar Awards for Crime Fiction. She works as an executive’s chief of staff at the Boston Medical Center. Anne Smart is the head librarian of the South End library is an invaluable member of FOSEL advisory board, especially in light of the library’s renovation projects. Maura Harrington was the FOSEL Capital Campaign’s invaluable co-chair, a generous volunteer for Local/Focus and the Holiday Party, and will continue to be devoted to the branch’s well-being. Licia Sky, a poet, composer and playwright, hopes to organize poetry slams at the branch, and aan evening of local folk music. Don Haber, as co-president of the Jamaica Plain branch library, is an invaluable sounding board and source of information about library renovations and BPL developments. Jacqueline McRath has been a loyal volunteer at FOSEL events, and has a wealth of knowledge about fiber artists, writers and poets in the South End community. Stephen Fox, as chair of the South End Forum and the Rutland Square Association, has been a vocal and important advocate for the South End library and Library Park with our elected city representatives and appointed heads of city agencies. Liane Crawford has made great recommendations for the Local/Focus window and has been very helpful in our fundraising efforts. Susanna Coit is a trained archivist at the Perkins School for the Blind. She is very excited to continue as an advisor as the library is going through its renovation process and has kept FOSEL abreast of new information about libraries. Michael Cox has recruited a number of speakers for South End Writes and is an active volunteer who distributes posters and flyers for our events throughout the neighborhood. Michelle Laboy’s contribution to FOSEL as an architect helping us to envision a welcoming and beautifully renovated South End library has been inspiring and gratifying. She has participated in numerous meetings with the BPL’s executive and project teams to advance the renovation plans. Gail Ide is a library abutter who has been a longtime South End library and Library Park advocate. She will continue to work on the redesign and planting plans for Library Park. Nick Altschuller has made very nice recommendations of authors for South End Writes and compiled a wonderfully curated set of crime fiction titles for our January Local/Focus mystery window, centered on Boston writers and/or fiction set in the Boston area. Reinhold Mahler is also an abutter to the library and has a background in architecture. He has made fantastic contributions to the formatting and design of the Local/Focus windows in the past year. The installations have never looked better and Reinhold is delighted to do more of the same in 2019. Marleen Nienhuis founded FOSEL in 2007. After leaving the voting board in 2010 and returning in 2014, her current term will end next year. A 2019 nominating group will focus on expanding/renewing FOSEL’s leadership for the 2020 terms. Chef John Hampton serving the holiday dinner at the South End library last year, with Pat Loomis and his Friends in the background. Yes, it’s that time of year when library staff and library supporters and friends get together for the Annual Holiday Party. As always, there will be Jazz and Blues music between the stacks, with Pat Loomis and his Friends who will include Antonio Loomis on guitar, Jim Dower, piano, Colescott Rubin, bass, and Benny Benson on drums. In addition, Loomis hopes to book a Special Guest, who shall be announced shortly. In previous years, the husband of library staffer Carol Glass, John Hampton, prepared dinner but, regrettably, he is unable to do so this year (though we hope he’ll attend). Instead, library staff and FOSEL board members are organizing dinner and drink. As always, culinary donations will be welcomed. Free to all. The library is fully handicapped accessible. South End recorder player Janet Fink and harpsichordist Alastair Thompson will play another one of their popular concerts on Saturday, December 8 at 1:00 PM, upstairs at the South End Branch of the Boston Public Library. The program will be of suites and sonatas by Johann Sebastian Bach, specifically numbers BWV 1031, 1033, and 1034. The program notes will tell the story of the multigenerational connections in the Mendelssohn family to Bach's works. Recorder player Janet Fink has studied with numerous local teachers and coaches. She has performed in the Boston area for more than twenty-five years, in recorder consort with, among other groups, A Moveable Feast, and as soloist with the Witchtrot Consort, the St John’s Ensemble, and the Hemlock Consort. Always on the lookout to help young struggling musicians, she currently serves as President of the Board of the new wind band, Grand Harmonie. Fink offers frequent recitals at the South End and West End branches of the Boston Public Library. Harpsichordist Alastair Thompson comes from a family of musicians and dancers and could not possibly stay away from the stage for long. In April 2011 he co-directed a stage performance of Matthew Locke's 1657 masque Cupid and Death (the masque is a form of festive festive entertainment that flourished at courts in 16th- and early 17th-century Europe). As a harpsichordist, he has accompanied performers at Boston-area conservatories and collaborated with many chamber ensembles, including Seven Times Salt, Les Enfants Terribles, the Zelenka Project, Patalena, the Weckmann Project, the Cavalier Consort, and Fourscore. He is also active as accompanist and administrator with Amherst Early Music. A team of Boston Medical Center pediatricians will be at the South End library to offer advice and suggestions in two interactive programs for parents and children. The first one-hour program will take place on Tuesday, October 23, at 6:30 PM, and center on literacy, reading together, and screen time for the young and very young. The second will take place on Tuesday, November 29 at 6:30 PM, and focus on oral health for toddlers and tweens. Parents can share concerns about child-rearing in a supportive environment with guidance from three top-notch local pediatricians. There will be space for play and crafts during the program. Teachers, parents, caregivers and grandparents are all welcome. For further information, contact head librarian, Anne Smart, at 617 536-8241 or at asmart@bpl.org. Library Park has been under construction since late July and is expected to be completed sometime in early fall. According to Lauren Bryant, the project direct for the park's reconstruction, the contractor will demolish the items in the park that will be replaced, like the bluestone pavement and the brick seating areas. Then the concrete pavement will be built (currently almost completed) and new benches, tables installed, as well as previous wrought-iron seating. Trees will be pruned and the soil will be amended. Any further updates will be reflected on this website. The recently reopened Jamaica Plain branch of the BPL has a beautiful new exhibit space devoted to a rotating crop of exceptional artists managed jointly by the JP Friends, the BPL and Uforge Gallery. The current display is by Cassandra Klos, a Boston-based photographer and conceptual artist, who was artist-in-residence at the Mars Desert Research Station, a space analog facility in Utah that supports Earth-based research in pursuit of the technology, operations, and science required for human space exploration. With prototype space suits and diets consisting only of freeze-dried food, people from around the globe dedicate weeks, or months, of their lives simulating the Mars environment to further the study of leaving Earth behind. Klos’s photographs of the project blur the lines between reality and science-fiction, depicting red desert landscapes, lonely astronauts, space station gadgets, and starry skies. A 2016 exhibit by Klos in the Griffin Museum in Winchester, MA, titled The Abductees, focused on Betty and Barney Hill, an interracial couple whose lives were forever altered after their controversial alien abduction in 1961 while driving through the White Mountains of New Hampshire at night. Klos studied art and psychology at the School of the Museum of Fine Arts. Her projects focus on manipulating the validity of photography and creating dual realities that breathe life into situations where visual manifestations may not be available. Along with several group and solo exhibitions, her work has been published in The Atlantic and The Boston Globe, and her photojournalism reporting has been published in TIME Magazine and Wired. Cassandra Klos: Mars on Earth is on view from March 2 through April 30, 2018. The newly renovated Jamaica Plain library is open Monday-Wednesday 10-6, Thursday 12-8, and Friday-Saturday 9-5 (closed Sundays). The exhibition space is located on the lower level. The next South End Library Easter Egg Hunt will take place, rain or shine (well...if it's a Nor'easter we might reconsider) in Library Park on April 1 between 11:00 AM and 1:00 PM. In reality, it will be over by 11:03 AM as the crowd of children that breaks through the fence at 11:00 AM sharp is primed for the hunt, as the image above attests. There will be more than 1,500 eggs filled with chocolate eggs, poems and knock-knock jokes (after all, we are a library Friends group), and delicious baked goods, coffee and lemonade will be available for all. We will have sectioned of a safe space for the defenseless very young children who would otherwise be run over by their older and intensely focused friends. The Easter Bunny has been convinced to do it one more time and apparently can't wait for the Hunt: it is the Bunny's favorite event of the year. We have some free baskets for those who can't find the ones from last year. They can be taken home and do not have to be returned. As always, we request and usually receive a police presence from our officers at Area D4. The gates will be closed until the countdown at 10:59:30 AM. Balloons decorating the fences can be taken home as well. This is usually the first event after the New England winter season has ended, and likely the last in Library Park as it is now constituted. If the weather gods are with us, it should be a lovely day, and a good farewell to the old and tired park. Next year in...well, maybe not Jerusalem but certainly in a better green space at the corner of Tremont Street and Rutland Square. Library Park in the summer, when colorful planters ameliorate an otherwise severely deteriorated green space. On Thursday, March 22, at 6:30 PM, a second public hearing at the South End library will be held to consider changes to the proposed redesign of Library Park. That design, pictured below, was presented to the South End Historic District Commission (SEHDC) on January 2 by Parks Department's project manager Lauren Bryant. The proposed redesign which, though favored by audience participants at the November public hearing, had to be amended after comments by South End Landmarks commissioners. Commissioner John Amodeo expressed concerns about how to best protect the root system of an oak tree near a to-be-expanded patio between the library and the park. The Landmarks request led to a design change substantial enough that another hearing allowing the public to comment is needed, said Bryant in a phone conversation last week. Additional suggestions by Commissioner Amodeo referred to park furniture that might impinge on a easy flow of foot traffic, and how to enrich the proposed new concrete pathways. The latter could be accomplished by adding 'accents' in materials that are historically appropriate for the South End landmarks district, such as thermal bluestone, or brick, Amodeo said. An alley way between the South End's Cathedral gymnasium and high school features such improvements, enlivening an otherwise dull concrete surface. At the first public hearing in November last year, Bryant and Brandon Kunkel, landscape architect with the Weston & Sampson design and engineering firm, presented attendees with three proposals for Library Park's overhaul. Two designs preserved the current layout of the park, while the third offered a different configuration. The latter was the one favored by the audience but has been altered to comply with Landmarks's comments. On Tuesday February 27 at 6:30 PM, the South End Writes will host Lauren Prescott, executive director of the South End Historical Society, who will introduce her first book, Boston’s South End, published in January. 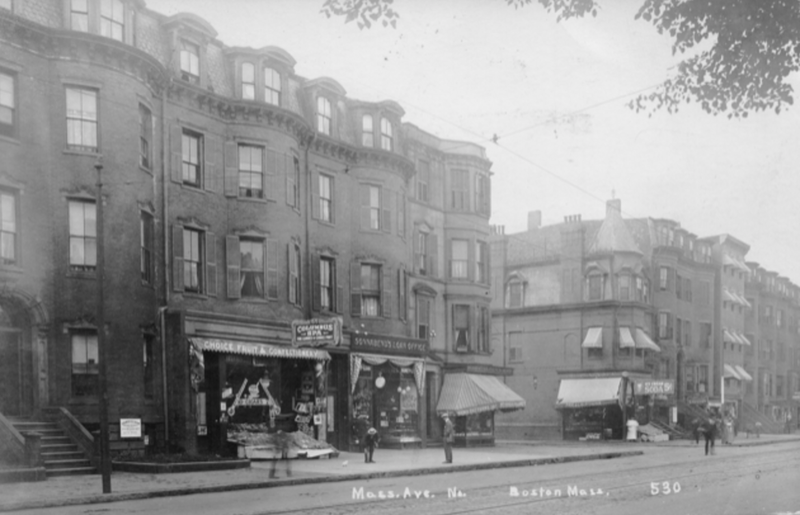 It illustrates the story of the South End neighborhood through vintage postcards that depict a series of local scenes and landmarks that define the feel and flavor of the neighborhood. She will be introduced by District 3 City Councilor Frank Baker who, with district councilors 2 and 7, Ed Flynn and Kim Janey, respectively, represent different parts of the South End on the Boston City Council. Drawing from the approximately 200 postcards that she discovered in the SEHS collection archive, augmented by photos that were also in the collection, Prescott presents an intimate and charming view of South End history, illustrated by pictures of private residences, schools and churches, theaters and nightclubs, businesses, industries and more. Many of the buildings shown are, sadly, no longer in existence but a number of them remain and, thankfully, continue to house families and businesses. Many postcards date from what is known as the "golden age of postcards," a period from about 1898 to 1915. Postcards were so popular during that era that demographic records show that in 1905, some seven billion postcards were mailed around the world. The number of postcards in circulation, which did not calculate those created by businesses for advertising purposes or the collections of individuals, is truly astounding when we consider that the world population during first decade of the 1900s is estimated to have been 'only' 1.7 billion. Prescott was born and raised in New Bedford, MA. She is a public historian, who received a B.A. in History at UMass Amherst and M.A. in Public History at UMass Boston. She has previously served as a Collections Management Intern at the Arlington Historical Society. In 2015, she became temporary administrator at SEHS but advanced to executive director in May 2016. The postcard collection, which was donated in 2012 and contains a number of unique examples, inspired her to choose this art form as the innovative theme for her book. Prescott hopes that the postcard history will raise the profile of SEHS, which was founded in 1966. Her primary goal is to make the collection more accessible to researchers and neighborhood residents. She also plans to explore and catalogue SEHS documents, photographs, maps and related historical records, and create “finding aids" that will make it possible for researchers to determine through an online search whether certain items are available at SEHS, and deserve a visit for further research. Her long-term vision is to establish SEHS as a true archive and research library, one that offers valuable information through its collections. Located in a classic and totally funky Victorian town house at 532 Massachusetts Avenue, Prescott invites all to visit the SEHS and join neighbors and friends in the Drawing Room to hear an enlightening lecture on local history or meet there to start a neighborhood walking tour. For a schedule of events and more information, please visit http://www.southendhistoricalsociety.org. The Friends of the South End Library will propose their next board on Tuesday, January 30 at 6:30 PM at the South End branch and you, the audience will have the last word. Among those attending will be BPL president David Leonard, who also serves on the Friends' Honorary Fundraising Committee. FOSEL voting members who are directors serve one-year terms while the officers (president, treasurer and clerk), stay on for two years. It is a diverse volunteer board, united in its commitment to the well-being of the South End branch. Some members are more active than others at different times, depending on their personal and professional obligations, but each has contributed to the improvement of the library. This year, all the terms are up, so new officers and directors will be elected and/or re-elected by none other than you, the audience. Officers: Kim Clark, clerk; Marleen Nienhuis, president; Barbara Sommerfeld, treasurer. Directors: Gary Bailey; Marilyn Davillier; Maura Harrington; Licia Sky; Duncan Will. Kim Clark: Kim is the founder of Polished Professionals Boston, a consulting practice that provides business strategy development and marketing solutions. She facilitates strategy-planning sessions in the for-profit and not-for-profit sectors and instructs aspiring entrepreneurs in the process of writing business plans. Kim is experienced in marketing and sales, creating and implementing strategic plans; participating in branding campaigns; forging relationships with decision makers and strategic partners; participating in the launch of new products; and managing a high-volume sales territory. Marleen Nienhuis: Marleen became a library advocate when she moved to West Newton Street in 2003 from Durham Street and found the small branch within walking distance. She formalized an already existing and devoted South End Library Friends group into a 501C3 non-profit in 2008, enabling it to raise funds for programming. With many others, she fought the proposed library closures in 2010. With the first FOSEL board, she organized the South End Writes author series, the summer jazz concerts, the Library Park Easter Egg Hunt and raised funds for various programs the South End library staff requested. She resigned as president of FOSEL in 2010, but returned as FOSEL president in 2016. Before becoming a library advocate, she was treasurer and president of the Friends of Titus Sparrow Park in the 1990s when the park was lobbying for its renovation, and helped create the Titus Sparrow Park summer programming for children, and the music programs. She is the membership chair of the Rutland Square Association. Barbara Sommerfeld: Barbara has lived in the South End for 45 years and raised two sons in the neighborhood. Now retired, after a career in elementary school teaching and text publishing, she received her MBA from Northeastern University and worked on the business side of non-profit organizations for 35 years. She has served as the treasurer of FOSEL since 2010. She was a tutor for K-3 reading program at St. Stephens’s after-school program and is currently tutoring at the Blackstone School reading program run by Generations, Inc. Barbara is proud of the staff and programs of the South End library and welcomes the opportunity to continue her association with this pillar of the neighborhood. Gary Bailey: Gary is Professor of Practice at Simmons College School of Social Work where he directs the Urban Leadership and Clinical Social Work Certificate Program and coordinates the Dynamics of Racism and Oppression Sequence. He has a secondary appointment at the Simmons College School of Nursing and Health Sciences, where he also serves as Special Assistant to the Dean for Inter-Professional Education. Gary has a Faculty Affiliate appointment at Harvard Medical School Center for Primary Care and is a consultant to Fenway Health Department of Behavioral Health, among his many affiliations. In addition, he is a member of several local boards, including the Fenway High School, the Friends of Harriet Tubman Park, and the Friends of Titus Sparrow Park. He is a trustee of the Union United Methodist Church, and a member of the Union United Methodist Church Leadership Team. Gary is interested in the issue of homelessness as they affect libraries. Marilyn Davillier: Marilyn is a licensed clinical social worker in private practice in Boston and an internationally known clinician in Child-Parent Mental Health. She provides therapeutic and consultation services for parenting support, child treatment and family mental health. She is the co-director and curriculum coordinator for the Infant-Parent Mental Health Fellowship Program at University of Massachusetts, Boston. She and her husband, child development researcher Edward Tronick, have been South End residents since 2003. They are keen to develop a series of parenting forums that pulls from their combined professional expertise, as a public service to their South End neighbors. Maura Harrington: Maura moved to the South End in 2013 but lived her entire life in greater Boston. Her professional career as a Group Health Underwriter for Prudential Insurance was paused to devote time to raising two children, now 21 and 23. Maura devotes her time to the CARES Pastoral Ministry and the Rainbow Ministry at St. Cecilia Parish. The main focus of her efforts are the rights and needs of the elderly, the homeless and the LGBTQ community. She has worked on the improvement and conservation of neighborhood treasures, such as the library and adjacent Library Park, as part of that interest. Besides FOSEL, she lends energy and support to the McKinley School, Boston Explorers Urban Camp, USES, The Southwest Corridor Park Conservancy, Boston Ballet and the BCA. Licia Sky: Licia is a singer-songwriter, playwright, and South End resident. She leads writing retreats and experiential movement and vocalizing workshops to facilitate self-awareness and connection with others. In the late nineties, she ran a poetry and music “open mic” for three years. She would like to start an “open mic” reading for the community through the South End library. Duncan Will: Duncan is retired after a career in independent school administration, including 25 years at Phillips Academy in Andover. He became a full-time resident of Concord Square last September but split his time between there and Nantucket since 2012. Duncan volunteered for the Nantucket public library, the Atheneum. Since moving to the South End, Duncan, guided by his friend and FOSEL board member Maura Harrington, has become a regular volunteer at Community Servings, the Pine Street Inn and the Boston Center for the Arts. In his spare time, Duncan enjoys weekly oil painting classes at the MFA and making paintings in his studio/apartment. Liane Crawford: Liane has been a South End resident for forty years and, with her husband Don, raised their three now-adult children here. Liane has served as board member for various organizations, including the board of the Eastern CT Symphony Orchestra and the Community Music Center of Boston Corporation. Liane worked closely with USES on the reopening celebration of the Children's Art Centre. Her background is in finance, marketing and fundraising. She currently consults for non-profit organizations. Susanna Coit: Susanna is the Archives and Research Library assistant at Perkins School for the Blind. She has an MSLIS in Archives Management from Simmons School of Library and Information Science. She helped bring the Local/Focus window for the Perkins School for the Blind to the library. Michael Fox: Michael Fox moved to the South End four years ago from Utah to participate in the city’s energetic startup culture. Subsequently, he’s worked at a variety of new businesses in an assortment of roles – he has made educational videos at MIT, written online journalism, and worked as a private chef. Along the way, he actively participates in Boston’s vibrant cultural scene – specializing in film, theatre, and literature – and writing for professional organizations like the Independent Reviewers of New England and the Boston Online Film Critics Association. Some of Michael’s plays have been produced in theaters across the country, and his films have been screened in festivals throughout the world. Michael actively uses the library for its many resources, but he has a special interest in the author series. He would like to help the Friends of the South End Library with programming and promotion. Don Haber: Don Haber is co-chair of the Friends of the Jamaica Plain Branch Library, the oldest Friends group in the BPL system (est. 1952) (www.friendsjplibrary.org). He began advocating for renovation of the JP Branch 14 years ago; last May it reopened after a $10 million renovation to spectacular reviews. For the past several years, he has attended most BPL Trustees meetings with Marleen Nienhuis. When the JP Branch was targeted for closure in 2009/10, he helped mobilize the effort to save all branches from closure. He also serves on the Advisory Board for JP Reads, a community-wide literary celebration (www.jpreads.org). Professionally, he is an attorney who works from home in Jamaica Plain. He also serves as vice-president of the Jamaica Hills Neighborhood Association. Stephen Fox: Steve came to Boston in 1972 to go to grad school and never left except for a three-year posting in Washington, D.C. in corporate government relations. He worked in educational research and consulting and was tapped by Mayor Kevin White as Special Assistant for Education Policy; shortly thereafter he became the mayor's Executive Assistant, working closely with all city departments, the Boston City Council, and constituencies and neighborhoods citywide. In the private sector, he was the Asia-Pacific Trade & Government Relations Manager for Digital Equipment Corporation and became its the Worldwide Trade Manager. When Compaq and then Hewlett-Packard merged with Digital, Steve declined to leave Boston for Texas or Palo Alto and went to work for a health care technology start-up founded by Tufts Medical Center CEO and Harvard research physician Jerry Grossman. After some 30 years of work within his own neighborhood association, Steve was one of the original founders, and now current chair, of the South End Forum. The Forum is the first South End-wide association to represent the common interests and initiatives of the now fifteen independent neighborhood and two business associations of the South End. Steve has been a long-time advocate for the library and its park at city agencies and with city officials, and will continue to play that role. He lives on Rutland Square. Michelle Laboy: Michelle is trained as an architect, urban planner and civil engineer and teaches architecture at Northeastern University. She also practices as an architect. She has lived in the South End for six years with her architect husband. Most of her work has been high-end residential and school projects, which are deeply focused on creating a meaningful connection between inside and outside. She and her husband won a City of Boston’s public-space award for the Library Park sustainable groundwater installations, the LightWells. Michelle was the moving force behind the multi-phased South End library renovation proposal, which is now receiving its first funding allocations. Jaqueline L. McRath: Jackie has lived in the South End for more than forty years, and feels that the library is one of the most treasured community resources. She recycles her Boston Globe to the library and is a grateful recipient of free books ("Open to All") on the library's front entrance cart. She frequently takes children's books from the cart to the pediatric unit of the South End Health Center. She has taken memoir writing at the Dudley Branch and would love to see such workshops given at the South End Branch. Jackie has published travel articles and poems, and covered FESTAC, 2nd WORLD BLACK AND AFRICAN FESTIVAL OF ARTS AND CULTURE for the Bay State Banner. She chairs the Theresa-India Young Scholarship Committee, which awards a scholarship in the Fibers Dept. at Mass Art. She is currently researching the life and works of Beat Generation Jazz Action surrealist poet, Ted Joans, and, most recently, provided full technical support to the Haitian surrealist painter, Patrick Gerald Wah. .Jon Santiago: Jon is a South End resident and emergency medicine physician at Boston Medical Center. Prior to completing medical school at Yale University, he spent five years abroad working in community development and public health. His experiences growing up in Roxbury have led him back to Boston where he remains engaged in issues affecting underserved communities. A big believer in public service, he is a captain in the Army Reserve and a former Peace Corps Volunteer. He looks forward to making the sure the library remains a valued and utilized resource in the South End. Anne Smart: Anne Smart has been an employee at the Boston Public Library for 25 years. Prior to working at the South End branch, she was in East Boston and Charlestown branches. She has been at the South End library for 20 years. She is a member of the board at the South End Historical Society, United South End Artists, and the Blackstone Community Center. She was raised on the South Shore and received her Master of Library Science degree from the University of North Texas. Lois Russel: Lois Russell, a former journalist, is a fiber artist and basket maker whose sculptural work appears in national exhibitions and publications. The former president of the National Basketry Organization, she currently serves on the boards of the Craft Emergency Relief Fund, the Society of Arts and Crafts in Boston and Planned Parenthood of Massachusetts. She is a graduate of Simmons College and Stanford University. Lois is interested in developing arts and public-health programming for the library, in collaboration with other board members. Karen Watson: Karen Watson has lived and worked in the Boston area for the past 20 years. She is a former board member of Outward Bound International, YMCA, and Thompson Island Outward Bound. Connecting the local creative community with the South End library to enhance the entire community is a goal she would like to pursue for the benefit of all involved. Karen has been the moving force behind the Local/Focus window installation project at the South End branch, which connects local artists, creative entrepreneurs and non-profits to the library and the community. Are you interested in joining the board? Let us know by contacting us at info@friendsofsouthendlibrary.org. The Friends have a voting board and an advisory board. Members of each participate in the meetings, email exchanges and volunteer activities as they are able to. Apart from the scheduled Annual Meeting at the end of January/beginning of February, the board(s) meet three of four times a year at a time convenient to all, either at the South End library, when it is open at night, or at the home of a board member. 1. Raising funds for the second phase of the planned interior renovation of the South End branch, a unique joint partnership between the BPL and the Friends: We are the first local library Friends group in Boston that has collected private funds for a branch's capital renovation. For the first phase, we have exceeded our fundraising goal of $50,000 by $30,000. We expect to do well in the second phase and..believe it or not..it is fun to ask for money for a great institution such as a local library that is so popular among its users. You can do it, too. For details, visit the Capital Campaign page, linked here. 2. The South End Writes authors program has brought famous and not-yet-famous, but always excellent, local authors and luminaries to the library for more than seven years, providing audiences with evenings of laughter, illumination and revelation. Board members Invite speakers who will be of interest to local residents, and help plan and promote the event. Over the years, nearly every board member has suggested an author or speaker, and none has ever disappointed. For a list of past speakers, click here. 4. Summer concerts in Library Park: Since 2009, Pat Loomis and his Friends have produced four very popular jazz & blues concerts each summer. You can help with additional musical events, and/or expand the current series, especially once Library Park will have been renovated, later this summer.